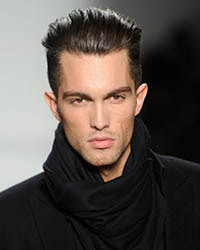 Tobias Sorensen was born in Denmark, on August 2, 1988, is a Danish male model. Tobias was discovered in a clothing shop Sixty Group, by model scout from Elite Modeling Agency. He got the scar on his left cheek as a result of a dog bite. Featured in short romance video Eternity Now by Calvin Klein (2015) with model Jasmine Tookes. He dated Victoria’s Secret Angel Jasmine Tookes (2012-2016). Cosmopolitan U.S., L'Optimum Thailand, GQ Style Russia Cover, Costume Magazine Cover, Glamour Spain, GQ Italia, Harper's Bazaar Serbia, Esquire Serbia, Open Lab Magazine, Magazine Antidote, Manifesto, Vogue Hombre, Vogue Mexico, DA MAN Style Cover, Made in Brazil, L'Officiel Hommes Middle East, Essential Homme Cover, Adon Cover, American Vogue, Carbon Copy, GQ Taiwan, METAL, GQ Magazine U.S., GQ Russia, GQ Spain, Euroman Cover, L'Officiel Hommes Brasil, Harper's Bazaar Vietnam Cover. Ugg, Calvin Klein, Hugo Boss, Iceberg, Vince Camuto, Belstaff, Triumph, Blanco, Siviglia, DKNY, Versace, Antony Morato, Kenzo, Paul & Joe, Husky, Diesel, Buffalo Jeans, Calvin Klein. Walked runway for Joseph Abboud, Michael Bastian, Todd Snyder, Giorgio Armani, Tod's, Dolce & Gabbana, Dirk Bikkembergs, amfAR, Jeffrey Fashion Cares, Jean Paul Gaultier, Elie Tahari, Nautica, DL1961, Parke & Ronen, Vivienne Westwood, Joseph Abboud. Represented by agencies New York IMG, Elite Paris and Milan, London Supa Model Management. I grow up in Soeborg, Denmark it is a suburb of Copenhagen. I had an amazing childhood, I would love my children to have the same memories I have. I was surprised I made it that far in modeling. Never did I think I would be on a runway or in high fashion. Neither did I think I would be that guy that you see in magazines. I'm not a very jealous guy, plus Jasmine doesn't shoot with men usually, but I think I would be pretty cool about it, I guess. We are in the same business, so we understand what comes with the job.